As I mentioned in this video, one of my favorite purchases earlier in the year was the printed silk scarf I picked up before my Miami trip. It’s been unbelievably useful, which really surprised me – I don’t buy prints very often, so I was very happy to discover it looked great with so much in my closet! It’s one of the easiest ways to add some flare to an otherwise basic tees + jeans look, you can tie it on handbags, wear it as a bracelet, you name it! I wore it all spring/summer, but the second fall hit I haven’t really been able to wear it. The colors are just too summery! I decided that if I was going to invest in another nice scarf, I wanted one featuring a completely different color scheme that would work year-round. 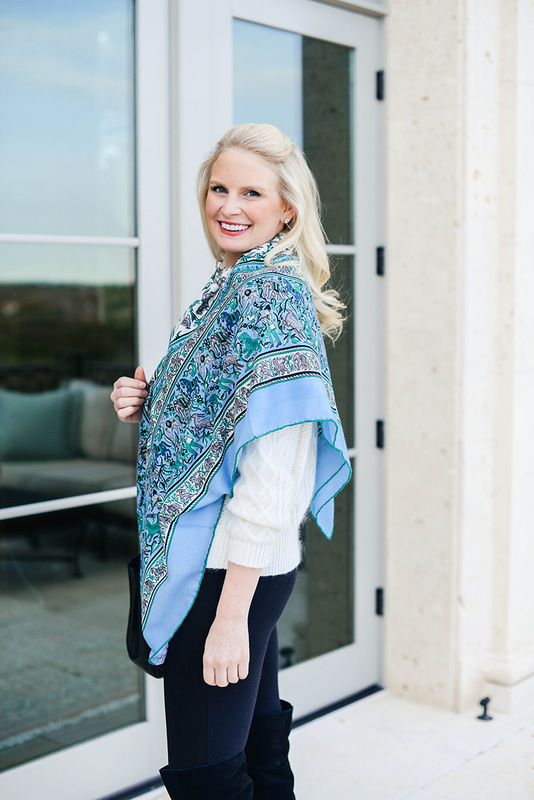 Not only does this scarf match my eye color, it features ivory and a super dark navy that looks like black, so it’s very versatile and looks gorgeous against all of the basics in my closet. There are so many ways you can style it, and while it’s cashmere, it’s actually lightweight enough for summertime. I’ve always wanted an Hermès scarf, so I decided to treat myself to one as a Christmas gift + a reward for a successful 2016. 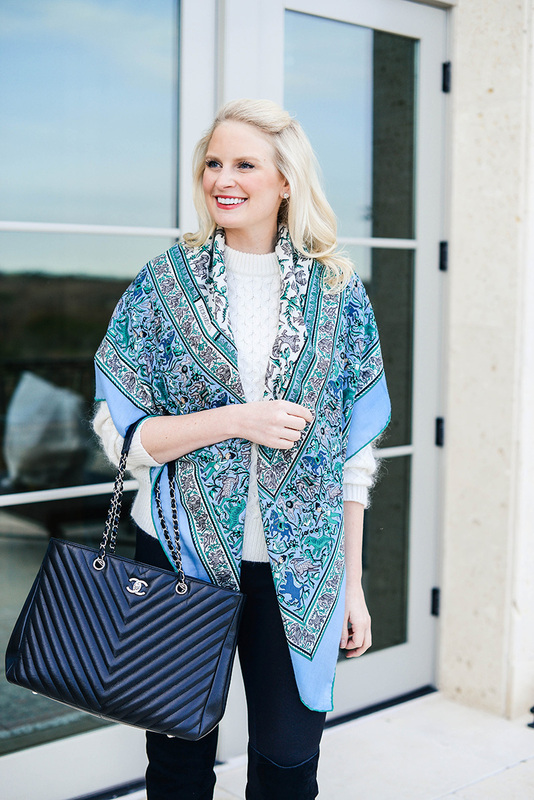 The tassel print on this Echo scarf will add a wow factor to any outfit you pair it with! Love the color scheme. This green, blue and yellow print scarf would look adorable over a gauzy white dress come summer! Looking for something office appropriate? Try this one by Vince Camuto. 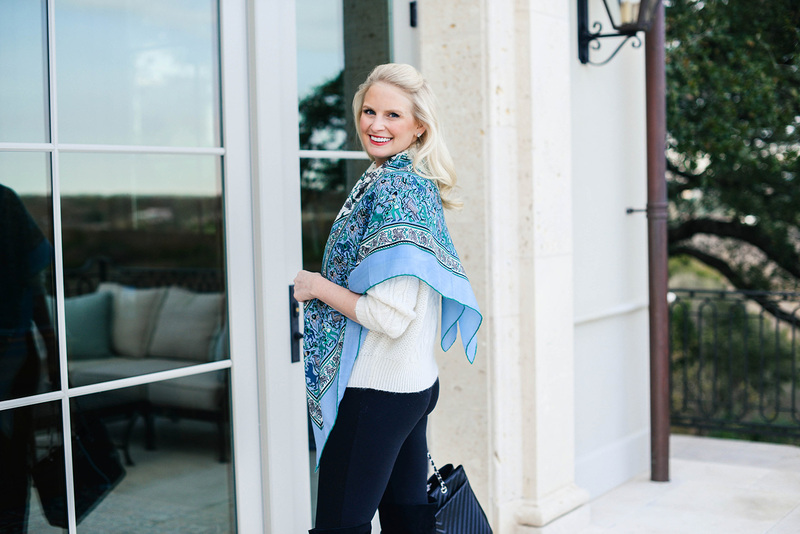 The botanical floral print on this scarf is to die for! For a more romantic look, try this soft Gardenalia scarf from Anthro. While not exactly “budget-friendly”, this fab Ferragamo scarf is on sale for under $200! If you’d love something Hermès but don’t want to spend full-price, try the vintage options at The Real Real! SO many gorgeous styles and prints! PS – I had numerous people on SnapChat request a tutorial for how I do my hair like you see above, so I just published a video with all the details! Click here to watch, and don’t forget to subscribe! 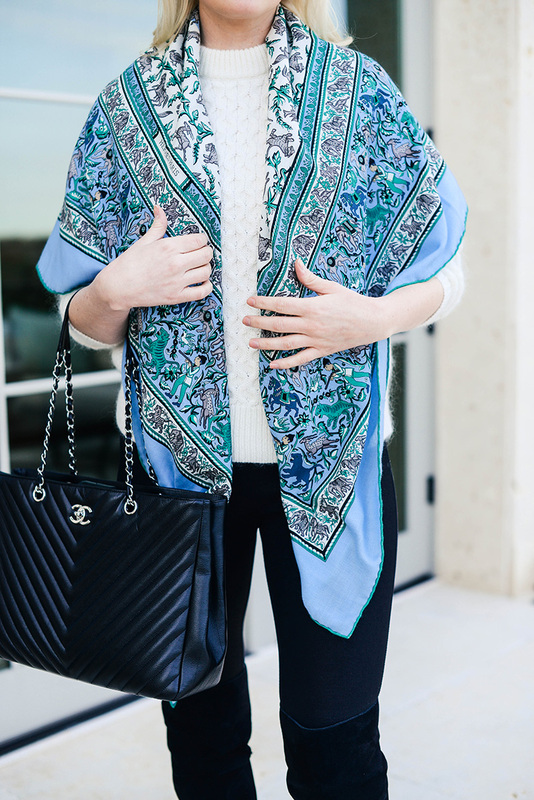 That printed scarf is gorgeous! Thanks for suggesting budget friendly ones! So classic! Love this look on you! 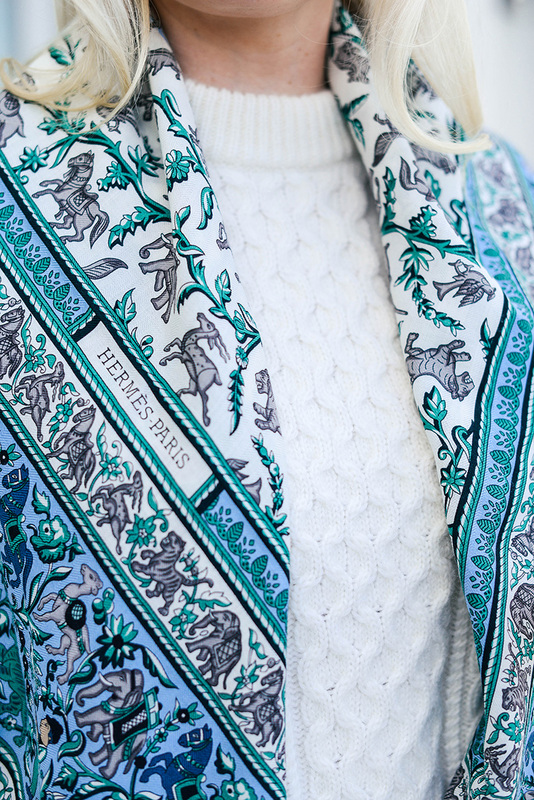 Love that Hermes scarf, such a great and classic pattern! My mom has passed a few of her hermes scarfs down to me and I am so grateful, at first I thought I wouldn’t wear them to often, I just was not sure they were for me. 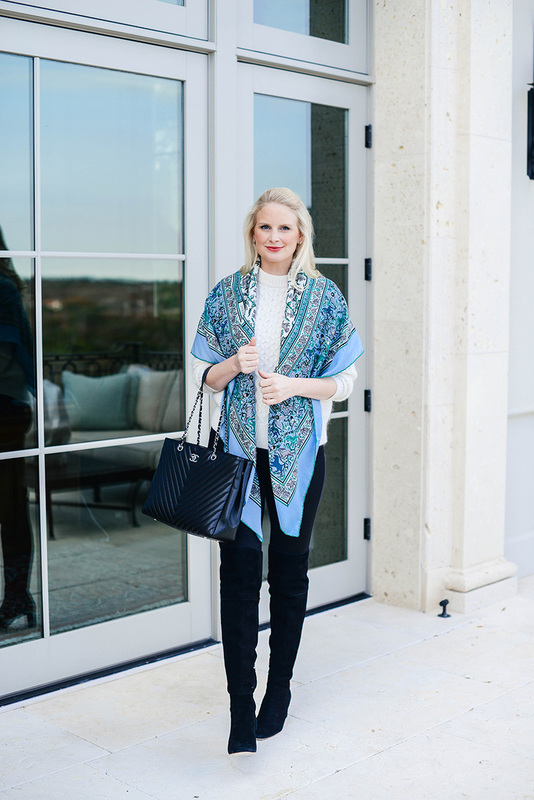 But I have found that I love adding them to monochromatic outfits works really well, so if I am wearing all black to a work event I will often throw on one of my scarfs to add some color! And not to mention, I just love all the patterns!